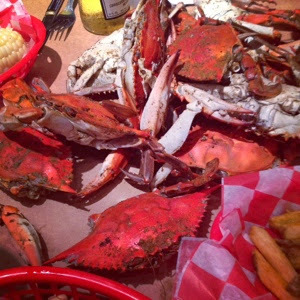 Crabs, crabs and more crabs at Phillips Crab Deck! A few weeks ago, I hoped on a plane and went to visit my friend in Bethesda, MD for a long, long weekend. I arrived Friday evening just in time for a quick dinner and few too many drinks. The next afternoon, we headed toward Annapolis, MD., to be tourists. 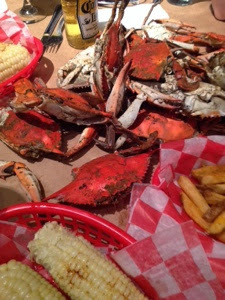 We walked around, shopped and then when dinner time hit, my friends took me to one of their favourite Maryland spots. Having grown up in Baltimore, my friend is a huge lover of crab and Old Bay spices, so naturally she took me for a real Maryland style crab dinner. Phillips Crab Deck is right on the water in Annapolis, and their huge terrace overlooks the bay. Being the crab pro, I let my friend order us dinner, I just chose the alcohol. 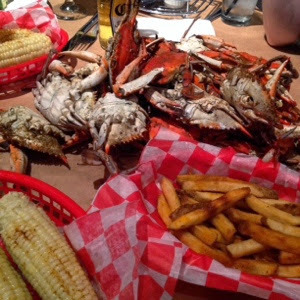 She ordered us a dozen crabs, corn on the cob, French fries and lots of Old Bay spices. I started with the oysters, a favourite of mine, served on the half shell on a bed of ice with lemons and delicious cocktail sauce. 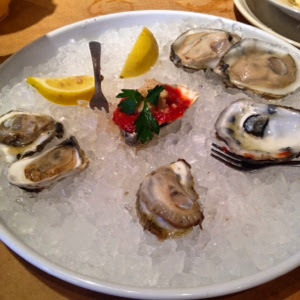 I shared the oysters with my friends, but they weren’t having any of it, so I enjoyed every last salty briny bite. They were delicious! We all ordered the cream of crab soup over their chowder and I think we made the right choice. 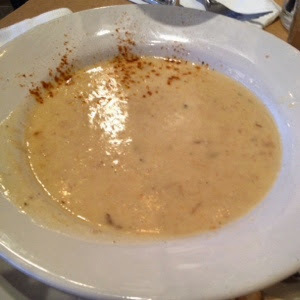 This soup was full of fresh crab meat and flavour – delicious! Spiced with the traditional Old Bay seasoning, this soup was the best way to start off our seafood feast. 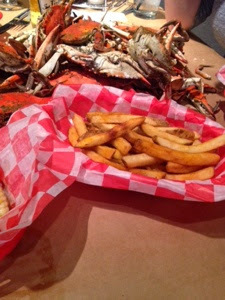 The crabs arrived in a large paper bag and we quickly dumped them on the table. My friend’s boyfriend begged us to keep the crab to our side of the table as he was a bit squeamish – haha!! 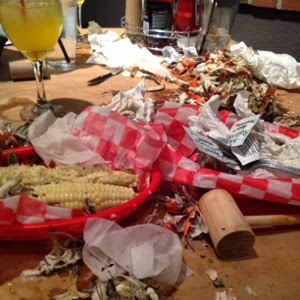 Maybe it was the mango Sangria, but I could swear there were way more than twelve whole crabs lying in front of me on the brown-paper covered table. We both dug right in and began pulling apart these delicious sea creatures. The Old Bay spice and crab meat was a delicious pairing; I really enjoyed the zing and spice of the seasoning mix. On a side not, I had the leftovers the next day with an Old Bay spice brewed beer, wow was that good too! The crabs were cooked perfectly; it was one of the best crab meals of my life. I cannot wait to go back. 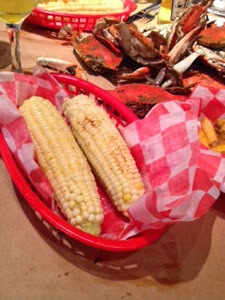 The corn was delicious dripping in butter and generously spiced with Old Bay. I normally do not like my corn with butter or salt, but with butter and Old Bay that’s another story. It is now my favourite way to eat corn, so addicting! The fries were really good too. Crispy fried and lightly spiced with Old Bay was how I ate them, but really I focused my attention on the pile-o-crab in front of me. The outcome of this meal was instant food coma. I could not move! I’m pretty sure the two pitchers of Sangria had something to do with it too, but the amount of food we had just consumed was inhumane. We should have never ordered a dozen crabs to begin with, but we also should have never eaten as much as we did. I for one was very happy to have these delicious critters for leftovers the next day, but was not really looking forward the cleaning them all – ouch! Moshi Moshi - More Sushi Please!!! !